We're excited to announce that the InsightAsia Thailand office has finished renovations. It wouldn't be a proper opening without the blessing of the holy Thai Buddhist monks for 2019. We look forward to kick off projects in the shiny new facilities. Come visit us at InsightAsia Bangkok, Yada Building - right next to the Saladaeng MRT skytrain station. 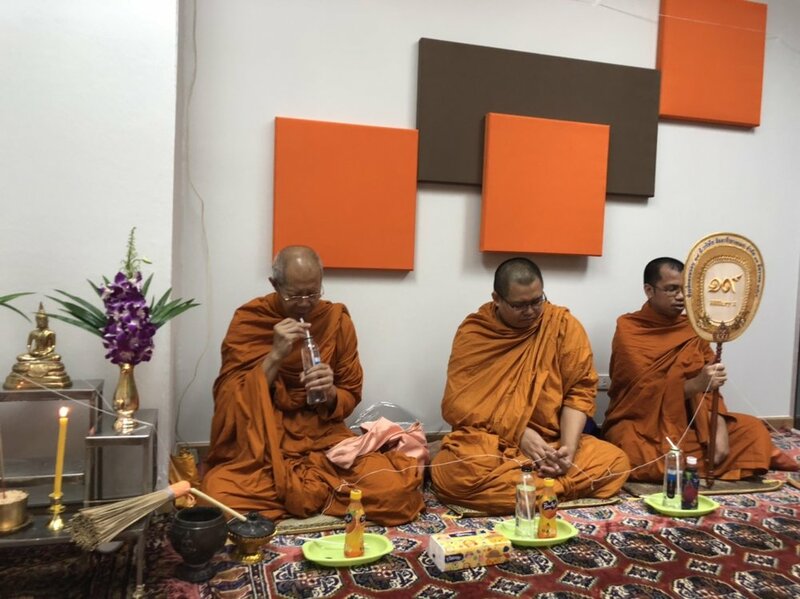 Posted on January 11, 2019 by Marjolein Winkelman and filed under Culture and tagged blessing ceremony renovations focus group facilities Thailand blessed InsightAsia Thailand Holy Monks. This August saw the launch of Go-Viet, a new urban ride-hailing company in Vietnam. Can Go-Viet repeat the phenomenal success that its parent company, Go-Jek, has had since starting up in Indonesia just eight years ago, and what does it take to grow your business across SE Asia? They say that necessity is the mother of invention, and that is certainly true when it comes to the unique architecture of the mega-cities of SE Asia, where high-density urban living, traffic gridlock and a young, entrepreneurial population on the move has led to the amazing success story of Go-Jek, the one stop shop for all your urban needs, delivered right to your door by bike. IA picked up on this trend in Jakarta with a blog post way back in 2015, and since then the Go-Jek offer has expanded to provide services such as Go-Med, Go-Clean, Go-Tix, and even Go-Glam and Go-Massage. In fact, Go-Jek has become so popular in Jakarta that it is hard to imagine life without it: pick up your medicines, clean your house, order some tickets - you name it, Go-Jek it. Now Go-Jek is expanding across the region, taking on rival courier company Grab with the launch in Vietnam of Go-Viet and the imminent launch of Get (Go-Jek Thailand). New services in Singapore and the Philippines are also on the cards. This news made me smile, because in a funny sort of way the Go-Jek trajectory reminded me a bit of the InsightAsia story. Of course, Go-Jek is a multi-million dollar company that is way bigger and much younger than IA, but after all, IA also started in Indonesia, exploiting a gap in the market and providing exceptional service before spreading its wings to set up offices in Singapore, China, Malaysia, Philippines, Thailand and Vietnam. So, I decided to ask IA founder and director Claire Koch for her recollections of starting out and what she remembers of growing the IA brand across the region. And now it is time to find out just what our local IA staff Loan and Hang thought of Go-Viet. Not surprisingly, both Loan and Hang were after a good service at a reasonable cost. First impressions are important and the Go-Viet app is simple and easy to navigate, making it straightforward for users to order a bike. And when it arrives, the bright, new, colourful uniform that the driver is wearing is a definite plus. This may sound superficial, but in a business where you are hopping on a bike to be whizzed around town by a driver you have to trust, smart fresh uniforms are reassuring. As Loan puts it "with Grab, the driver’s uniform is old. I appreciate good service from drivers and good policies from their company." Likewise, Loan and Hang appreciated the clean new helmets supplied by Go-Viet - by contrast, Grab users can feel that they have to wear a helmet that is not as clean as it might be. Not all Go-Viet drivers were in their new uniforms, however, and some were even wearing the Grab outfit. This was a definite minus point which both Loan and Hang found unsatisfactory. Will Go-Viet revolutionise service provision and be another winner for Go-Jek? The Go-Viet launch has been relatively low-key, starting out with just two services, Go-Bike and Go-Send, in three cities - Ho Chi Minh City, Hanoi and Danang. (The full Go-Jek offer comprises 16 services in 50 cities). But both Loan and Hang were excited for the possibilities of additional new services coming to Vietnam in the future. Loan would like a bit of pampering with Go-Massage and Go-Clean, whilst Hang just laughs: "I am an easy customer" she says, "so it would be great to have all these services in Vietnam." Overall, with an easy-to-use app and competitive introductory rates keeping prices low, first impressions from our testers of Go-Viet were positive. But it will be interesting to see if Go-Viet can maintain their shine once the dust settles. And how will Grab respond? The arrival of a new player in the market might provide an incentive for them to refresh their offer too. Either way, the arrival of Go-Viet suggests that another game-changing, Go-Getting shake-up of urban city living is on the way across the region. Posted on October 29, 2018 by Marjolein Winkelman and filed under Culture and tagged Vietnam lifestyle technology Go Viet business consumers. InsightAsians are on a mission to spotlight, educate and act against indiscriminate use of single use plastic. We think the biggest threat to humanity & beautiful Asia is the irreversible damage plastic waste is creating to our rivers, beaches, oceans and aquatic life. With the poor and sometimes non-existent waste management infrastructure across emerging Asia, plastic and non-compostable garbage is having a catastrophic impact. Our Thai team are already on the case. Inspired by the Ministry of Natural Resources and Environment’s slogan: เปลี่ยนโลกสดใส ลดใช้ถุงพลาสติก. Direct translation – ‘Make the world better, use less plastic bags’, InsightAsia Thailand made sure they enjoyed a plastic free ‘play date’ together at Kanchanaburi. To support the government initiative to use fewer plastic bags, our Thai team used reusable cloth bags during their recent team away day. The cloth bags are made from organic material that is biodegradable. Perfect for work, play and all future shopping trips! We are taking baby steps to speak up & act on how we consume, use and dispose of plastic at work and home. We are also hungry to support research initiatives pro bono for this cause. Contact us today if you would like our support with researching how to educate and change attitudes on waste management and plastic usage. Together we can create a new norm! Posted on October 8, 2018 by Marjolein Winkelman and filed under News and tagged No Plastic less single use plastic InsightAsia Thailand biodegradable recycle clean oceans market research. InsightAsia Philippines recently went through a UX research training programme by Christine Balatbat, co-founder of UXPH, certified designer and researcher. How did they get on? Posted on August 31, 2018 by Marjolein Winkelman and filed under Products and services, News and tagged user experience user experience research UX ux research ux philippines Philippines InsightAsia Philippines research researchers. JD’s unmanned store in Jakarta: Is Indonesia ready? At InsightAsia, we’ve always got an eye on the latest tech innovations entering the Asian markets. Find out what happened when we took a look around the latest addition to Jakarta’s shopping scene – an unmanned JD store. Posted on August 29, 2018 by InsightAsia Team and filed under Culture and tagged JD unmanned store tech technology retail online retail shopping ecommerce Indonesia InsightAsia Indonesia Jakarta Asia Asian market research Asian trends. At InsightAsia, we love taking our international clients on a food adventure. Discover poke bowls, the Hawaiian-inspired food trend sweeping Asia. Posted on August 15, 2018 by Marjolein Winkelman and filed under Culture and tagged trends in asia trends Asia market research Asian market research food food and beverage sushi poke bowl InsightAsia. Have you been plogging yet? Discover the latest fitness trend springing up across Asia. Posted on July 26, 2018 by Marjolein Winkelman and filed under Culture and tagged fitness trends trends in asia Asia fitness trends market research Asian market research plogging instagram global global trends. Looking to reach the Vietnamese millennial population in your future creative work? Take a look at a recent presentation by our Research Director, Tran Lien Phuong, which explores the current and future millennial consumer landscape. Posted on July 24, 2018 by InsightAsia Team and filed under Culture, Products and services and tagged Vietnam InsightAsia Vietnam millennials Vietnamese millennials trends consumers Asia InsightAsia.